Desert Regional Medical Center has been named a Leader in LGBTQ Healthcare Equality by the Human Rights Campaign Foundation (HRC), the educational arm of the nation’s largest lesbian, gay, bisexual, transgender and queer civil rights organization. The designation was reported in the 10th edition of the Healthcare Equality Index (HEI), reflecting on a decade of progress in LGBTQ healthcare. A record 590 healthcare facilities actively participated in the HEI 2017 survey. In addition to active survey participants, the HRC Foundation proactively researched key policies at more than 900 non-participating hospitals. 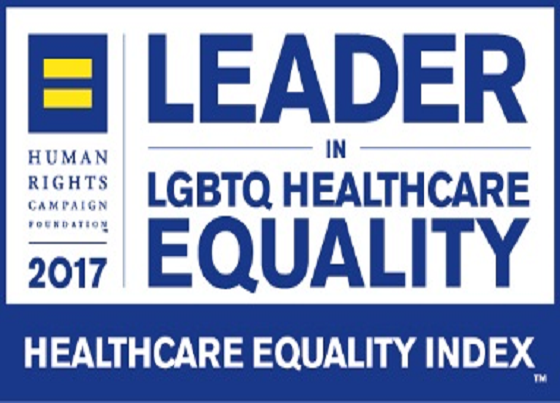 Of those included in the HEI, 302 earned a “Leader in LGBTQ Healthcare Equality” designation. This year also marks the first time the HEI has awarded numerical scores — and three quarters of the healthcare facilities actively participating in the survey scored 80 points or above. Desert Regional Medical Center scored 100 out of a possible 100 points to earn the Leader in LGBTQ Healthcare Equality designation. “The 2017 HEI reminds us again that though we have made tremendous gains over the past decade, there is still much more work left for us to do. With some of our biggest battles still ahead of us, it is crucial that institutions continue to demonstrate that the march toward full equality is not slowing down,” said HRC President Chad Griffin. “The 590 participants in this year’s HEI continue this march in partnership with the LGBTQ community. For the past decade, the HEI has been the roadmap to closing the gap in ensuring equal care to LGBTQ patients and their families, and we urge every healthcare facility to join us in this continuing effort to provide inclusive care to all. Desert Regional Medical Center is a comprehensive health care institution that includes a 385-bed hospital and associated outpatient clinics headquartered on its main campus in Palm Springs, California. The medical center is home to the Coachella Valley’s only designated Trauma Center and only Neonatal Intensive Care Unit. The medical center is recognized for its Comprehensive Cancer Center, Institute for Clinical Orthopedics and Neurosciences (ICON) and other affiliated outpatient clinics. It has achieved advanced certification as a Comprehensive Stroke Center. Desert Regional is the only Coachella Valley hospital to receive advanced certification in Heart Failure, Hip and Knee Replacement, and Spine Surgery from the Joint Commission, the nation’s foremost hospital accrediting body. Desert Regional is a teaching hospital aligned with the University of California Riverside School of Medicine with a residency in Family Medicine. Desert Regional also hosts medical residents in neurology, neurosurgery, emergency medicine and internal medicine through the American Osteopathic Association residency program. For more information, visit www.desertregional.com.